The word SOIL! etched into a field at the University of Sydney’s IA Watson Grains Research Centre at Narrabri to mark World Soil Day. LAST year they produced the word FOOD! 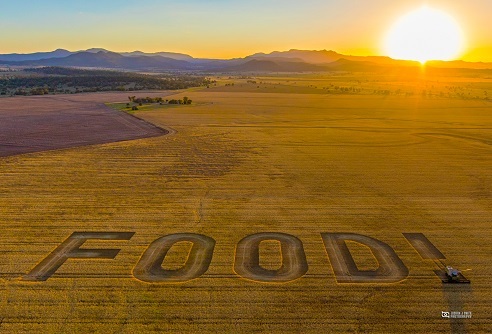 written in big, bold letters with a header in a wheat crop to celebrate Australia’s first National Agriculture Day. 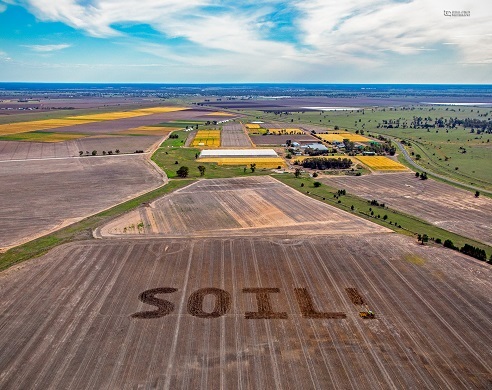 This year, the team at the University of Sydney’s IA Watson Grains Research Centre at Narrabri in north west New South Wales has been at it again, scribing the word SOIL! into a field of wheat stubble to mark the United Nations World Soil Day. The word, which is 216 metres long with letters 60m high, was written in the paddock by a GPS-equipped tractor and disc implement. The team responsible for the large-scale piece of rural artwork include the university’s director of northern agriculture, Guy Roth, cropping supervisor Kieran Shephard, photographer Josh Smith and aircraft pilot Joe Smith. “Last year we wanted to do something to contribute to the National Agriculture Day to help the community understand some of the technology used to produce food. This year our cropping supervisor Kieran Shephard worked out all the maths, programmed the navigation system and ploughed the letters into the fallow wheat stubble,” Professor Roth said. He said the drought and recent dust storms in western and north west NSW were a reminder of the need to carefully manage soils for the long term benefit of society and the national economy. “I recall from the famous book by John Steinbeck book, The Grapes of Wrath written in 1939 which we studied in high school about drought and dust storms, and its impact on family farmers in the US Mid West,” he said. “It is not a story about wine waking at all, which many people have joked with me over the years: rather the tragedy of the depression, the drought and the subsequent dust bowl of unsustainable farming practices caused by drought. The tractor and disc ‘writing’ implement are visible in the dot of the exclamation mark, highlighting the scale of the 216-metre-long word. Professor Roth said the University of Sydney, through its work at the Narrabri centre, was a world leader in soil science. “It is ranked in the top four research institutes in the world and Narrabri has been an important part of this story of international research excellence,” he said. World Soil Day is an initiative of the Food and Agriculture Organization of the United Nations (FAO) within the framework of the “Global Soil Partnership” and is celebrated annually on December 5. Last year’s word FOOD! 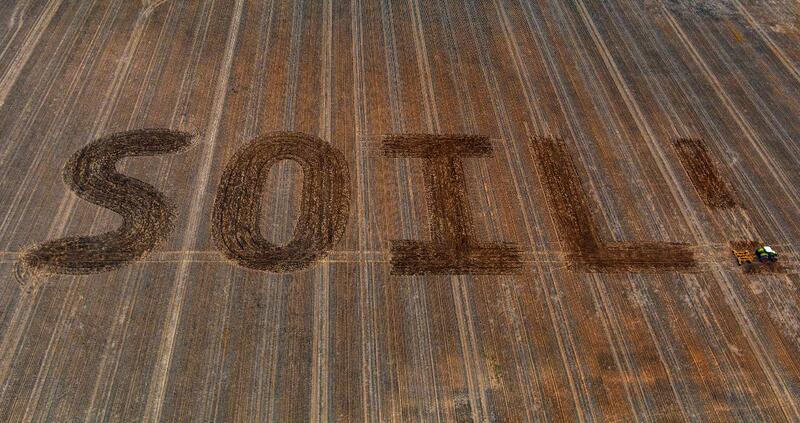 written with a header in a wheat crop to celebrate Australia’s first National Agriculture Day. The University of Sydney took the opportunity on World Soil Day to launch a $1.1 million, three-year project that will translate soil science research into free digital tools for farmers. The project, to be run by Andrea Koch Agtech in cooperation with the Sydney Institute of Agriculture at the University of Sydney, Australian agtech start-up Farmlab, and AGRIVision Consulants, is funded by a Landcare Smart Farming Partnership awarded in June. Led by Andrea Koch Agtech, it involves a collaborative partnership of agronomists from AGRIVision, scientists from the University of Sydney and developers from the Australian agtech start-up, FarmLab. They will collaborate over the next three years to turn University of Sydney soil science into a suite of six innovative digital soil management tools for land managers. Andrea Koch Agtech principal, Andrea Koch, said she was excited to bring agile development to the translation of existing science into practical digital tools for farmers. “It’s a big step forward in Australian agtech. Developing these tools is not only great for Australian farmers, the approach we take will demonstrate a new pathway for stranded science to be translated into action through agtech development, supporting future research and innovation methods for Australian agriculture as a whole,” she said.